Happy Monday my Darlings! Today we are uber excited to introduce to you our latest Vendor del Encanto, Camille Fontz. Camille is one of the sweetest people you will ever meet. She is super laid back, very artsy and has an amazing eye for photography. Welcoming her into our vendor circle was a no brainer. Brace yourself for some truly amazing pictures! When I first saw these I didn't event think they were taking in Puerto Rico. 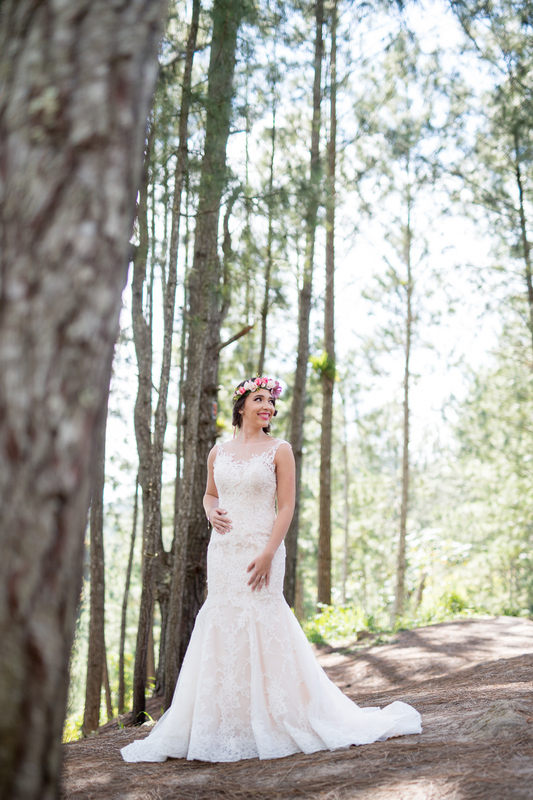 We are known for our beaches and tropical locations, so I loved that this outdoor styled shoot shows us a different side of our gorgeous island. What makes this styled shoot even more special? The couple actually just got married! From the Photographer: You've seen them. I've always dreamed about taking two gorgeous models in wedding attire to an exotic location, bringing floral arrangements, and shooting away! 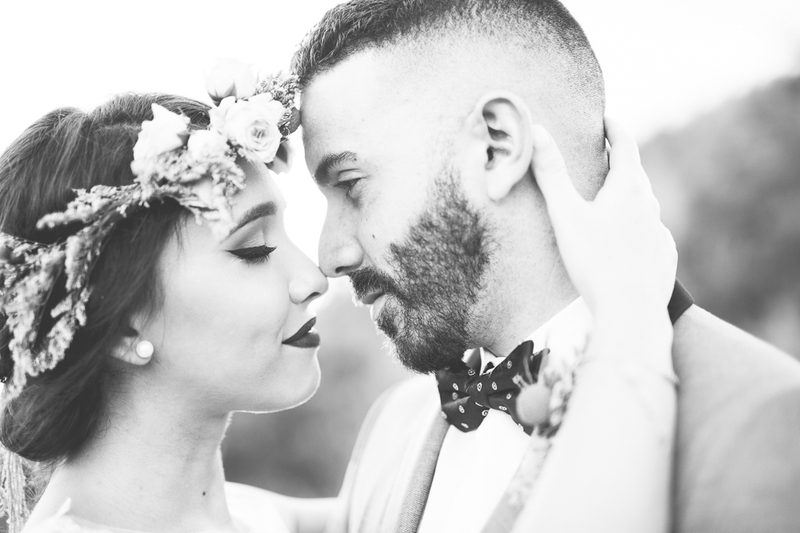 However, in my opinion, shooting models takes out of the equation the most essential element, the one that really makes a great wedding image: love. So a while after Mónica and Andrés got married, and since both still had their wedding attire, I proposed a shoot! Luckily they said yes! They're gorgeous honeymooners, lifelong friends, and they also happen to love photos. I'm blessed, I know! I was finally able to do my styled shoot with all the elements I've always wished for. The planning began as an informal shoot, basically a photo roadtrip wearing their wedding attire. Weeks after, Mónica said she would be hiring again her wedding make-up and hair artist Raiza Montes. Later, she proposed wearing a flower crown, which she bought online. Then Angélica, my best friend and Mónica's sister, also bought flower crown for herself. Then, we decided we wanted two locations: Bosque de Pinos en Cayey, and a stop on a desert in Salinas along the highway. Seven days before the session, I decided to go all in, and called my friend and excellent wedding planner Maribel Ramírez, and asked her for a bouquet. On such short notice, Maribel outdid herself and not only brought a bouquet, but also a boutonniere and a real, matching flower crown! By this point I couldn't contain my excitement! Here is a little info on the couple. After many months of MSN messenger chatting back in 2007 Mónica & Andrés slowly but surely fell in love. Mónica was 16 while Andrés was 20 years old. After an amazing eight years together it was time to pop the question! On October 18th of 2015, their 8th anniversary was what seemed like a normal Sunday. A pretty boring Lazy Sunday with just simple date night plans. They got dolled up and ate an amazing dinner. Then, just before dessert Monica's and Andrés' parents, Angélica, Camille, Israel and Susan walked into the restaurant and Andrés stood up and took the microphone. He sang 'Can't help falling in love' while Monica was perplexed and confused. Then, Monica's dad gave the ring to Andrés, he got on one knee and proposed. With a mess of tears and overwhelming emotion, Monica said yes! Make sure to check out Camille's Vendor del Encanto page and trying not to go crazy over these pictures!